More than 30,000 contract health employees, including medical officers, lab technicians and other health workers took part in the protest. Bengaluru: Demanding equal pay for equal work, the indefinite strike by contract workers of the health department at Freedom Park entered the second day on Tuesday. 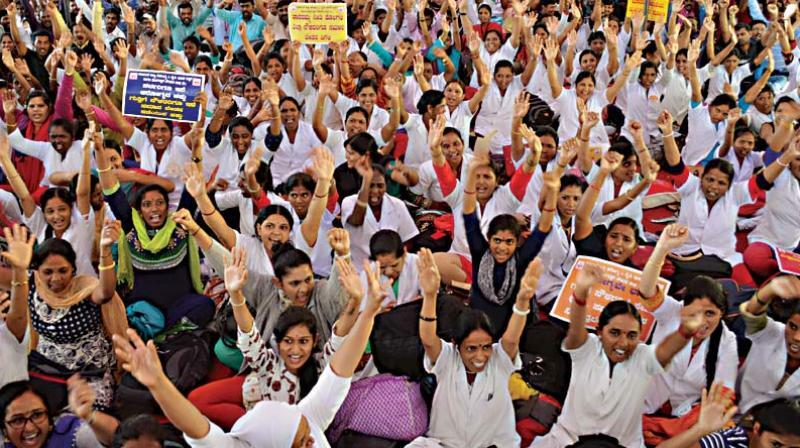 More than 30,000 contract health employees, including medical officers, lab technicians, staff nurses and other health workers took part in the protest. While it was feared that the strike might affect services at hospitals, the health department on Sunday clarified that they would not face any issues as they have enough staff to cater to the needs of patients. However, the health department on Monday evening issued a circular to all the govt hospitals/medical/nonmedical staff to be present at work round the clock keeping the public interest in mind. “The working staff should be made to work round the clock and no leave should be permitted until further orders,” read the circular. Protesters claim that the state government has failed to implement the 2016 Supreme Court ruling that had ordered for indiscriminatory payment of wages.